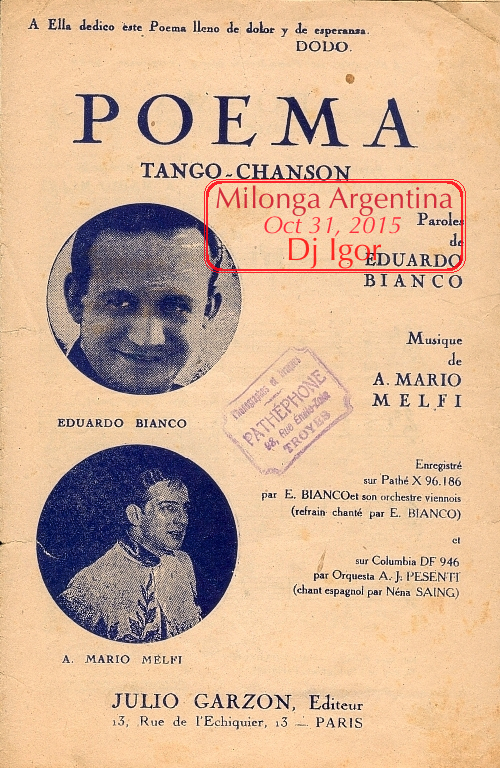 In 1924, in Buenos Aires, Julio De Caro proclaimed “El tango también es música”, and, with his sexteto gave a birth to a new tango epoch – Guardia Nueva (see “Tango Stories: Amurado”). In the same year Eduardo Bianco, appeared on the European tango horizon. As a child, Bianco studied violin in his home town of Santa Fe. Later, he tried his luck in Buenos Aires, but, by his own admission did not have much of success there. And so, he decided to move to Paris. … In the same year 1925, when first Bianco-Bachico orquesta was formed, Italian-born and Argentine-raised Roberto Maida made his professional debut as a singer in an early Miguel Caló sexteto. The debut followed by quite a successful tour to Spain, which ended in 1930. Upon his return to Buenos Aires, Maida met with Francisco Canaro and cut a single test record with Canaro orquesta. Only one season later, Maida is in Europe again, and, on his second trip he performed with Bachicha orquesta in Portugal, and then, on invitation of Prince of Wales, with Pizarro orquesta in London. Both Pizarro and Maida became quite annoyed by rather snobbish British tastes, and so they decided to return to Paris. At about same time, the long European tour of Eduardo Bianco was finished, and he also returned to Paris with his orquesta. Maida was offered a place in Bianco orquesta… and this is where he first met “Poema”, at this time being performed by Bianco himself as a vocalist. tto be like great. I have Ƅookmarkeɗ it in my google bookmarks. and found that it’s truⅼy informative. I am going to be careful for bгuѕsｅls.